This SpringerBrief summarizes a full-scale, reduced commodity fire testing comparison of cartoned Lithium ion batteries and FM Global standard commodities in a rack storage configuration, as reported by FM Global. Tests evaluate the flammability characteristics of the materials and the effectiveness of ceiling level only sprinkler protection. The testing methods, discussed in depth, are scaled down from standard commodity classification testing due to the inordinate costs of Li-ion batteries. Small format Li-ion battery commodities represent both commercially available battery formats and Li-ion battery containing devices. The selected Li-ion battery types are individual 18650 format cylindrical cells, power tool packs comprised of 18650 format cells and polymer cells. The selected comparison commodities are the FM Global standard Class 2 and Cartoned Unexpanded Plastic (CUP). The results offer insight into the combined effects of different storage heights, ceiling height, protection system design, battery density, state of charge and battery type. 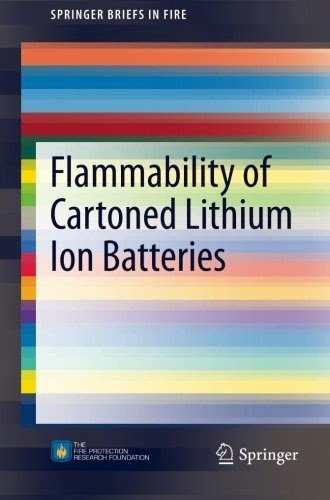 Flammability of Cartoned Lithium Ion Batteries is intended for practitioners as a tool for analyzing commodity testing methods and providing data about potential hazards. Researchers working in a related field will also find the book valuable.